Right now, we're working on writing summaries of stories. And it's a difficult task! Every year, I find myself starting at the beginning once again, helping young readers to find their way through text. 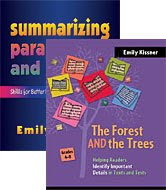 Summarizing brings together so many different skills. 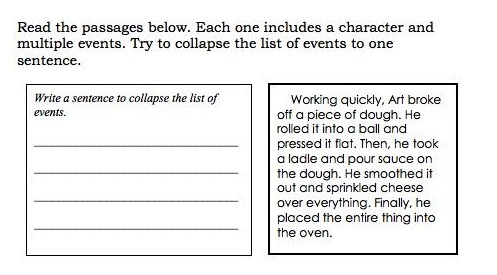 One skill that readers need for effective narrative summarizing is the ability to collapse lists. Collapsing a list is simply renaming a list of specific ideas with a general term. For some items, this is fairly easy--the list of cherries, pineapples, and strawberries can be collapsed to fruit. In other lists, however, it's a little harder. This task is made even more difficult for struggling readers who may not always understand each component of the list, either due to decoding problems or a lack of background knowledge. The list of Little Round Top, Devils Den, and the Peach Orchard is easy to collapse for Civil War buffs or residents of Gettysburg--these are sites on the battlefield. But someone without this background knowledge would not be able to collapse this list. We hadn't gotten to the fourth sentence before a student called out, "Pizza!" We looked at which clues had helped them to figure out that the text was referring to making a pizza. Then, students worked to write a sentence to collapse the list. In this case, their sentence was also a summary of the paragraph. You would think it would be very easy, but many of my students struggle with vocabulary tasks. For ELL students, choosing an appropriate verb is often the hardest part of this. Some of them even had trouble identifying the name of the character, Art. We talked about what they were imagining and what problems they were having. Then, we modeled a good summary of the paragraph. "A baby!" one of the students exclaimed. Then we went through and underlined all of the details that helped us to figure this out--the high chair, the tears, the sippy cup. I drew a quick picture of a sippy cup on the board for those students who didn't know what one is, along with clarifying how "'nana" would be spelled if the author were referring to a grandmother. How would you collapse this list of events? For most adults, the word just trips off the tongue--a tantrum! After a few minutes, one student in my group offered this word, which turned out to be new to about half of the group. These sentences came much more easily, especially once students had this perfect word that encapsulated the entire list of events. My classroom was very busy today with many visitors--none of them human! Then, as students began to arrive, one student brought me a butter container with holes in the top. Veteran teacher know what this means--butter containers seem to be the creature transport containers of choice! What was inside? A beautiful Polyphemus moth. Of course, this changed our Morning Meeting a bit, as we looked at information about the Polyphemus moth and followed the excellent links from this great website. Kids were fascinated to learn that the adult Polyphemus moth has no mouthparts! We learned that our moth is a male, because it has such long, feathery antennae. To make room for the moth, I had to juggle around some other creatures, including our tadpoles. Notice how they still have their external gills. Safe in their plastic container, they got to spend the day on the table, very convenient for viewing and enjoying. Students drew pictures of them throughout the day and made a gallery of beautiful artwork on the closet door. At the end of the day, we were going to set the moth free. In the transfer process, it escaped. Should have seen that one coming! But I must say that the classroom is much improved by the flapping of a huge moth. The kids took it very calmly, even though it was during our chaotic afternoon dismissal time. Luckily, it landed on my fluency data binder, where I was able to capture it once again in the butter container. What a day! Springtime in fourth grade is always adventurous. Oh, and somewhere in the middle of all of this we took a science test, learned about the landforms of the Midwest, practiced spelling words, wrote summaries, and took a simulated trip to Mexico City to learn about elapsed time. It's wonderful to work with such fabulous new teachers! Last week, as we were talking about getting started with personal narratives, Ashley and Melinda suggested that we start with the emotions chart that we've been using in reading. This makes perfect sense--after all, a personal narrative should be based on strong emotions. And students were already working on using emotion words to explain how characters feel at different parts in a story. So putting together the chart and the personal narratives helps to bridge the reading and the writing quite nicely. It turned out to be fun and quick way to get kids brainstorming ideas for their personal narratives. After they filled out the chart, they moved around the room to interview each other and share their stories. This helped them to quickly figure out which stories they liked best. Last time, I wrote about modeling the use of a chart for tracking inferences. This week, students were in charge, working in pairs or triads to read a book and create the inference chart. It has worked fairly well. Here are some things to keep in mind if you are trying to help struggling readers make and record their inferences. I chose texts that were quite easy for students. With this lesson, I wanted them to concentrate on making inferences, not struggle with decoding. At the same time, the texts need to have some meat to them. A fabulous bookroom find! I like this one because it's an easy read, but has some lasting questions to think about. The illustrations are informative and engaging. Another good find with a Revolutionary War theme. Some students had already read this earlier this year, but there is value in going back to a book, especially for the purpose of making and tracking inferences. It's been a favorite of the groups who have been reading it. This book is good for some students. The flashback in the book makes the narrative a little more complex, even though the text is quite simple. 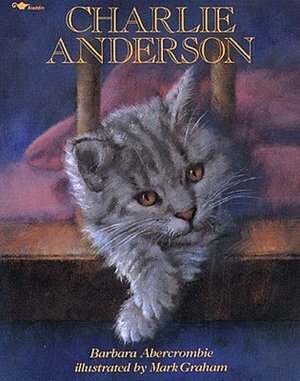 This cute book has a surprising ending. Great for the animal loving kids! But even with good modeling and great texts, some kids really struggle. This is the hardest part of making inferences--getting kids to animate the process. In fourth grade and beyond, there are some kids who are happy to read the words aloud and not go any further. To help the kids realize that they need to make inferences, I put Post-Its at different spots in the books. (This actually isn't as time-consuming as it sounds. I quickly did this while the students were doing independent reading, putting questions in only one book per group.) For some groups, I wrote a specific question (How do you think the character feels? What trait could describe___? ); for others, I just put a note that said, "Make an inference here." I love, love, love giving kids lists of related words. This emotion chart is another good scaffolding tool for students. They really do refer to it as they read, looking for the words that capture their inference. It's always encouraging to hear kids talking about whether a character would feel "depressed" or "grief-stricken" in a given situation, referring to the text to support their ideas. A character traits chart is also helpful. These tools give them more support in making inferences. As I listened to kids, I did hear a few weird inferences. This doesn't concern me as much as it once did. I think it's part of the practice process, reflecting a bit of risk-taking for the reader. When kids read together, they'll often talk each other out of these weird inferences. Why the inference chart again? 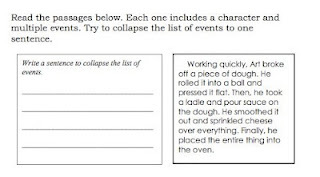 Part of my goal is to help students realize how often they are making inferences...and be able to identify both the text clues and their own background knowledge they are using. The chart is a great low-risk tool to help them do this. 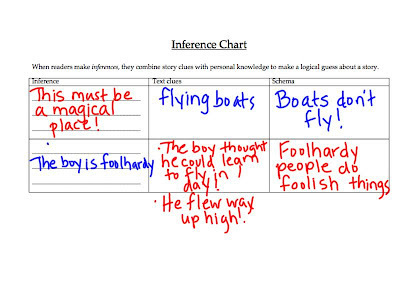 As students work on making inferences, I like to show them how to use an inference chart to record their thinking. The chart I use is based on the one in the Comprehension Toolkit by Stephanie Harvey and Anne Goudvis, with a few minor changes. I put the "Inference" column on the left, with "Text Clues" and "Schema" heading the other two columns. I use the term schema because it's a word that is used in third grade, and is familiar to my students. This column could also be called "Personal Knowledge" or "Background Knowledge". To model the chart, I have to choose the absolute best book to share with students. With some groups, I use the book The Gardener by Sarah Stewart. This book is loaded with opportunities to make inferences, from the pictures to the text. But with some groups of readers The Gardener just doesn't work as well. For students with attentional difficulties, there are just too many places to make inferences in this book for it to be effective for whole-class modeling. 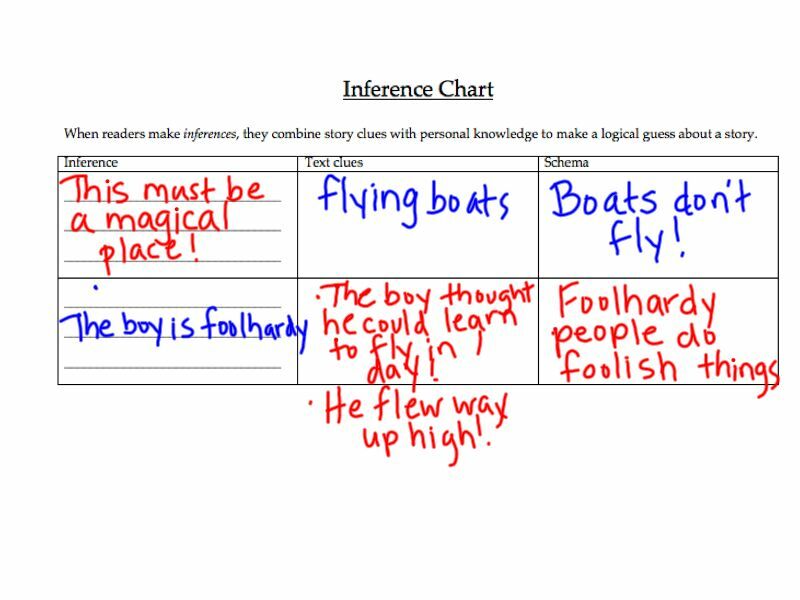 When I model an inference chart, stopping to write too often can be disruptive to the flow of the story. 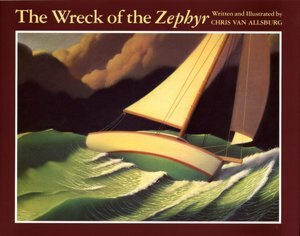 This year, I tried The Wreck of the Zephyr by Chris Van Allsburg as an alternative. It worked perfectly! We made about one inference per page. The story is rich, with opportunities for deeper thinking, but not so complex that it was difficult for students to understand. Kids often have trouble with the "Schema" column. They don't realize how they have to simply write down what they already know. As I model the chart, I try to show students how the Schema column simply comes from their own minds--for example, the things they know are true, or the explanations for character traits. This is not really reading-related, but is just plain fun. In my first five years of teaching, I taught in one of those modified open-space schools. As the new teacher, I had the interior room with no windows. So now that I have windows, I make good use of them! Springtime isn't springtime unless I have seedlings in the windowsill and tadpoles in the aquarium. Planting seeds is really quite easy, even if you don't have a green thumb. I like to buy one of the seed starter kits. The kids love to watch as the pellets expand with warm water. I label it like a Battleship grid so that everyone can easily find their plants. This also helps them to practice using a grid system. I can't ever get just one kind of seed. I've had good luck with zinnias, nasturtiums, and basil. These all have very different looking seeds, which leads to discussions--will the biggest seed sprout first? Why do they look so different? I always plant some extra seeds in case there are some that don't grow, and for those students who want to take home an extra plant or two for other special people in their lives. 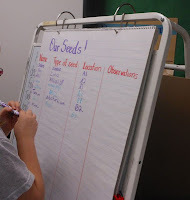 We keep track of the growth of the seeds on a chart. The basil sprouted first, but the nasturtiums are the most impressive. The zinnias don't look like much at first, but they are my personal favorites for their cheerful summer blooming. To keep the plants from getting too leggy, I rotate the container every few days. Kids go over and check on their plants every day, talking about how they have changed and which ones are doing particularly well. 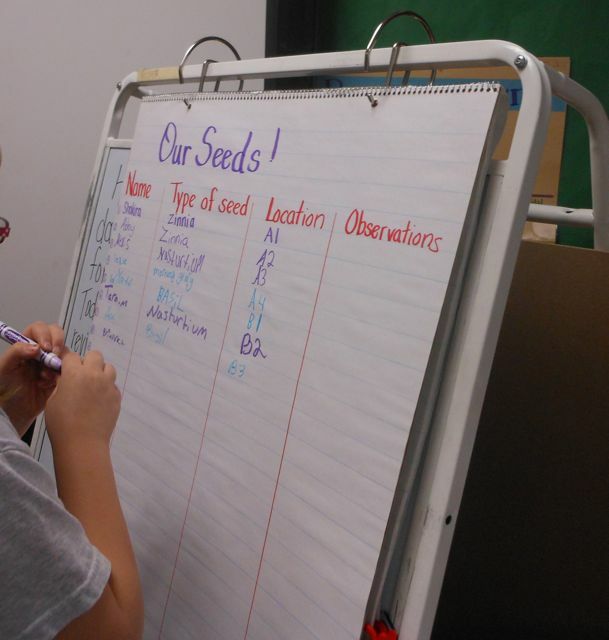 Once the initial planting is done, I don't have to do much besides the rotating--the student with the naturalist job for the week waters each day, and the kids are happy to check on their seeds each day. In about three weeks, they'll be ready to transplant into cups that will be decorated and taken home. That will add a bit of clutter to our windowsill--already crowded with my geraniums and two student terrariums--but that's what windowsills are for, right?